What’s It About? 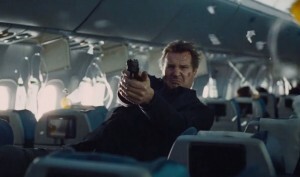 Neeson plays Bill, a US air marshal who receives a series of threatening texts during a transatlantic flight. The anonymous terrorist vows to kill somebody on board the plane every 20 minutes unless the airline transfers $150 million into his account. However, as Bill attempts to find the culprit, he realises that others believe he is the terrorist. Verdict: Non-Stop is an intense film whose story will have the audience on the edge of their seat throughout. From its opening scenes, the film paints every single passenger as a potential suspect, which instantly puts you on edge as you don’t know who to trust. The majority of the film is set on the airplane, and this makes for claustrophobic viewing which only adds to the tension. By the time the film ends you feel like you were on that plane journey yourself and it is a relief to be walking out of the cinema all in one piece! The audience receive information and clues at the same time as Bill, and you’re constantly trying to guess who the culprit is, but red herrings are often thrown into the mix to put you off the scent in very clever directorial decisions. Liam Neeson plays the troubled air marshal with ease and his character’s dedication to saving his fellow passengers is nothing short of admirable. Even when the pilots, ground control and passengers turn against him and accuse him of being the terrorist, he doesn’t give up trying to protect them or find out who is behind the madness. Julianne Moore is also strong as Jen, a fellow passenger in the seat next to Bill, who you quickly discover is one of the few people on the plane you can trust. When everybody turns against Bill, Jen and air hostess Nancy (Michelle Dockery) stand by him, which makes it a less frustrating watch. You can’t help but get angry when plans to save the plane are hindered due to almost everyone’s complete lack of faith in Bill. The fact there are two solid characters who aren’t pointing the finger and throwing around accusations makes it much less stressful viewing than if absolutely everybody was against our leading man. The best thing about Non-Stop is that you get so involved in trying to work out who is the suspect that the viewing time flies by. The mystery alone makes this film edge-of-your-seat viewing, but the clever cinematography which has text messages come up on screen, the array of different characters that add an element of realism to the situation, and Neeson’s strong and emotive performance also make the film an enjoyable roller-coaster ride from start to finish. Although not entirely disappointing or implausible, the revelation of who’s behind the terrorism does not match the high standards set by the rest of the film. It simply isn’t as shocking as it should be and there are definitely other options that would have had a bigger impact on the audience. The reasons given for the hijack aren’t particularly strong and many questions are left unanswered as we quickly move from a mystery thriller to full-blown action as gun shots and explosions ring out in the epic slow-motion battle we’ve come to expect from Neeson’s films. Despite this slight hiccup, the real crux of the film is the mystery and although the reveal doesn’t quite hit the mark, it doesn’t take away from the 90 minutes of expertly-played intrigue and tension. The climax of the film is so dramatic and intense that you step out of the cinema with heart pounding, bated breath and a minor fear of flying; the revelation of who was behind the murders soon becomes irrelevant. Final Words: Non-Stop is not without flaws, however it’s a strong action thriller that will you have you on the edge of your seat throughout. The premise of the film means you’re constantly engaged as you look for clues and hints whilst trying to work out the identity of the terrorist. And how emotionally invested the audience becomes in the story speaks volumes. Non-Stop is definitely one of the biggest must-see action films of the year! Non-Stop (12A) is released in UK cinemas on 28 February 2014.